Before the term “bucket list” became oh so chi-chi and pervasive throughout society here in the NA, I had vowed as a young man to one day travel to South Africa and somehow meet Nelson Mandela. In 2009, I accomplished the former, but sadly not the latter. Four years later Madiba would be gone. Just as with Mahatma Gandhi’s passing in 1948, the world felt a little colder, a little darker that December day when Mr. Mandela left us. It’s rare that there’s more than one towering figure of humanity every generation, a person who so captures the imagination and respect of the entire world, a man or woman who inspires not a country or a religion or an ethnicity, but the whole of the human race. Nelson Mandela was one of these unforgettable historical figures. In light of the current political volatility gripping much of the planet – from the Boko Haram insurgency in Africa to the immigration disaster unfolding in Europe, from the rise of ISIS in the Middle East to the birth of a new intolerance in the world’s most powerful country – I look to extraordinary leaders both past and present for inspiration. 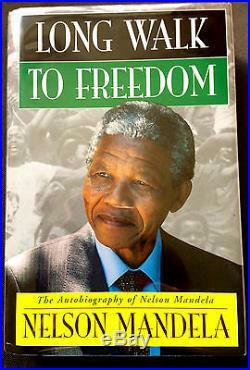 Today, I turn to Nelson Mandela and his autobiography, Long Walk to Freedom.